The status of brownfields redevelopment in California in 2013 wavers between dismal and moribund. With the dissolution by Governor Brown of the redevelopment agencies in early 2012, California lost one of its strongest tools to clean up viable properties, including the liability relief they offered to new owners. Furthermore, California’s budget crisis of the past five years has dried up any public funding for brownfields cleanup. The recession and unemployment are lingering longer and deeper in California than the rest of the country, and the recent tax increase voters approved will mostly accrue to schools and education. With the exception of Silicon Valley and the Bay Area, real estate values make most brownfields redevelopment infeasible. To make matters worse, a recent report, entitled “Golden Wasteland,” charges California Department of Toxic Substances Control, one of the principal State agencies overseeing brownfields clean ups, with a case of extreme inertia, ranging from gross inactivity to deliberate abdication of duties, among its many allegations. It also contains accusations of excessive coziness with industry, which could put a chill on future clean ups. There are some positive attributes to report in this bleak picture. The regulators themselves are more responsive if a brownfields project can get off the ground. The complex patchwork of regulatory agencies is less daunting because the agencies have settled into and accepted MOU jurisdictional boundary lines negotiated and drawn in 2005 and they are loathe to cross those boundaries. The lenders are more comfortable with the regulatory agencies, more trusting and accepting of their “no further action” letters with less fear of “reopeners.” Additionally, the State’s Water Resources Control Board has a new low-threat closure policy for thousands of properties that should free up development on low-risk sites with former underground storage tanks. However, these positive attributes are once again overshadowed by activities such as the State’s recently announced cost recovery effort. In response to significant media and public scrutiny, DTSC recently identified in a self-report that it has done a very poor job of seeking cost recovery in past clean up actions. 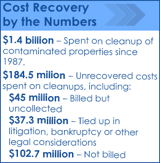 Over $140 million in clean up costs incurred by the State were not billed to the responsible parties and another $45 million in invoiced costs were never collected. A new financial and accounting team has been established, including a new “czar” appointed to invoice and collect the $184.5 million from private parties who have some liability for the past pollution. Expect a bill in your local mailbox soon. Maureen Gorsen is a Partner at Alston & Bird LLP located in Sacramento and within the firm’s Environmental & Land Use Group. Ms. Gorsen was former Director of the California Department of Toxic Substances Control and former General Counsel of the California Environmental Protection Agency.